Summary: Reflecting on his unexpected friendship with an animated girl named Gracie, Luke explores his life between the ages of eleven and thirteen living in 1940s Junction, Manitoba. A small town with short-sighted ‘Christian’ views, townspeople start gossiping when they find out Gracie was born out of wedlock, and that her mother may be a prostitute. Unfortunately gossip turns to action and Gracie is left to feel the brunt of their judgement at school, facing ostracism by everyone except for Luke and a beloved teacher, Miss Prutko. When Miss Prutko is fired, things get worse, until one day a tragic case of being in the wrong place at the wrong time changes everything for Luke and Gracie. Review: First off, don’t read the Memorable Quotes section if you haven’t read this book yet because it contains spoilers. What a book! I love The Glory Wind‘s reflective nature and Valerie Sherrard’s choice to have the book narrated by Luke some years after the actual events took place. You can tell everything has been simmering inside him, and what comes out is both powerful and enlightening. It truly put me in mind of To Kill a Mockingbird by Harper Lee, as it captures small town life, the duality of religious beliefs and the judgement people dole out for others they perceive to be less than they are. Serious themes are explored by children, trying to find their way in a world full of unspoken rules and harsh attitudes. I had three favourite characters: Gracie, Miss Prutko and Carmella Tait. Gracie because she’s so full of light. When the others were trying to make her feel bad about herself and her beginnings, it just seemed like a crime against nature, that they would try to repress this irrepressible child. And when they began to succeed I was heartbroken. But Miss Prutko feels this injustice acutely, and gives Gracie support when she needs it most. She harbours no judgement toward her, and lets Gracie know she is a valued part of her life. It took courage for Miss Prutko to stand up to the town, and I admired her for it. Carmella is wonderful because she tells it like it is. She respects Luke and Gracie’s questions about life and endeavours to answer them in an honest but also age appropriate way. I loved her parable about the filly, even though I wasn’t quite sure if the filly was meant to represent Gracie or her mother. Or perhaps it was more of a cautionary tale, because Gracie could have easily become the filly/mare who had lost her spirit. While he wasn’t a favourite, I did enjoy the complexity of Luke. Looking back he can see exactly where he went wrong but now there’s nothing he can do to change it because the past is past. Through his experiences he genuinely grows up, and I believe in the moment he was doing his best as an eleven year-old boy. There’s such a wistful air to the book; it’s clear he wishes he could do things over, and knowing that he can’t will stay with him forever. He holds such conflict within him, and my heart went out to him because of that. The Glory Wind is another story of Christians who decide their belief in God gives them the right to judge others. In that respect it reminded me of Who Has Seen the Wind by W.O. Mitchell. Also like Mitchell’s work, it is suitable for teens and adults, and deserves a place as a Canadian classic. It is so beautifully written, and there are many layers to sink into. I like that it isn’t an easy ending. When everything goes down, all that is left is grief, and Luke’s personal memories of a life touched love and the kind of friendship he will never know again. “That doesn’t change the fact that I’m haunted by that moment, frozen in time. I can see her face, turned to me, those small brows knitted together in puzzlement. I can feel the hurt behind her words, the inability to understand why she’d felt no movement behind her. If I had lunged forward or reached for her, it wouldn’t have mattered that it was too late. She would have known that I’d made the effort. But I didn’t, and her question still troubles me. “‘I even went to church one Sunday,’ she continued, ‘just wanting a little comfort, thinking there might be some kindness there. But all I felt in that building was the excitement of people who thought they might see me fall on my knees and confess or repent or something. I might have known, really, and saved myself the humiliation if I hadn’t been so desperate. After all, these are the people who can sit around forgetting everything they’ve ever done wrong in their own lives, while they smugly talk about how Gracie disappearing was some kind of punishment God is using to slap me. “I’d never really given any thought to what faith was before that moment. It seemed an abstract thing, something you couldn’t define or touch. I’d thought faith was what you believe and that was it. But I sudden;y saw that believing was only a part of it. After all, belief is something you think – but you can be mistaken in your thoughts. And you can change your mind and stop believing something, so faith must go past that. Faith must be a kind of trust that doesn’t need to understand something to know it’s so. 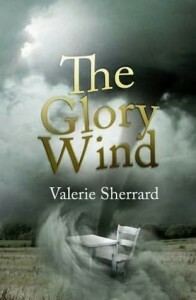 The Glory Wind by Valerie Sherrard, is published by Fitzhenry & Whiteside, (2010).